1) This paper has been selected to the article of the month because of it is the background paper for the special session on Cadastre 2034 at the FIG Working Week in Marrakech in May 2011. This paper was originally presented at the FIG Congress in Sydney in 2010. It was also a starting point for the special issue of GIM International on future cadastres. Handouts of this presentation are available at: http://www.fig.net/pub/fig2010/ppt/ts08k/ts08k_bennett_rajabifard_et_al_ppt_4096.pdf. You can download the special issue of GIM International from the here. It includes an interview with Hernando De Soto and the series of articles Beyond Cadastre 2034. Over the last thirty years spatial information technologies and sustainability theory drove the creation of new visions, models and roles for the cadastre. Concepts including multipurpose cadastres, Cadastre 2014, and sustainable land administration radically altered understandings of the cadastre and its potential. Many of these concepts continue to be relevant in the contemporary context; however, like all disciplines, cadastral science must continue to look to the future to remain relevant. This paper begins this process and aims to provide preliminary insights into the characteristics and potential role of future cadastres. A qualitative research design based upon an exploratory case study underpins the research. Factors including globalisation, population urbanization, good governance, climate-change response, environmental management, 3D visualization/analysis technologies, wireless sensor networks, standardization, and interoperability are found to be driving developments in the cadastral domain. Consequently, six design elements of future cadastre emerge: Survey-Accurate Cadastres, Object-Oriented Cadastres, 3D/4D Cadastres, Real-Time Cadastres, Global Cadastres, and Organic Cadastres. Together, these elements provide a preliminary vision for the role and nature of future cadastres: the elements can be seen as likely characteristics of future cadastres. Collaborative research, potentially through the FIG framework, would enable further development of these design elements and would assist in defining the nature and role of future cadastral systems. In the final decades of 20th century cadastral systems were revolutionized: spatial information technologies and sustainability theory drove the creation of new visions, models and roles for the cadastre. Innovative concepts and seminal documents including the Multipurpose Cadastre (McLaughlin, 1975; Williamson, 1985), FIG Statement on the Cadastre (FIG, 1995), The Bogor Declaration (FIG 1996), The Bathurst Declaration (UN-FIG, 1999), Cadastre 2014 (Kaufmann and Steudler, 1998), the Core Cadastral Domain Model (van Oosterom et al, 2006), and the Land Management Paradigm (Enemark et al, 2005) radically altered understandings of the cadastre and its potential. Practical implementations can now seen in the land administration systems of both developed and developing countries. To remain relevant cadastral science must continue to look to the future: potential challenges and opportunities need identification, analysis and response. Cadastral theories and models developed over the previous thirty years (e.g. Multipurpose Cadastres, Cadastre 2014 etc.) require reappraisal in the contemporary context. Cadastres must continue to change to meet the challenges of poverty, environmental protection, good governance and economic stability. This paper aims to summarize recent developments and provide preliminary insights into the characteristics and potential role of future cadastres. The research design is first articulated followed by a brief summary of developments in cadastral theories and models over the last thirty years. Particular focus is given to their applicability in current contexts. This analysis leads to a discussion of new macro-environment drivers (e.g. economic issues) impacting on the nature and role of future cadastres. The drivers are then used to propose the characteristics of future cadastral systems. Six conceptual design elements emerge and are discussed: Survey-Accurate Cadastres, 3D/4D Cadastres, Real-Time Cadastres, Global Cadastres, Object-Oriented Cadastres, and Organic Cadastres. The paper concludes by calling for more collaborative research to be conducted into the nature and role of future cadastral systems. The preliminary vision supplied here can be used to initiate these disciplinary discussions. A qualitative research method was utilized. Specifically, an exploratory case study was devised (as distinct from ‘descriptive’ or ‘explanatory’ case studies). Exploratory case studies discover new theories often after the completion of data collection (Yin, 1993). In essence, they are used to develop hypotheses that are more rigorously tested in later studies. This technique appeared highly appropriate as the study aimed to generate hypotheses for the nature and role of future cadastres. As the study was not directed at any specific country, state or jurisdiction a global perspective was utilized. Figure 1 illustrates the four main stages of the study. First, a review of pre-existing global cadastral trends was undertaken. This enabled current contexts and predicted trends to be understood. Second, future societal scenarios were studied using the PESTLE methodology (Aguila, 1967; Turner, 2002). The year 2050 was used as an endpoint for these macro-environment forecasts. Potential changes to political/legal, economic, social, technological, and environmental were assessed. A number of pre-existing scenario tools were used to guide the analysis including the Special Report on Emissions Scenarios prepared by the UN’s Intergovernmental Panel on Climate Change (IPCC) and the UNFPA’s State of World Population reports (UNFPA, 2009). Third, outcomes from the future scenarios were used to predict responses from governments, land administrators, and cadastral scientists in relation to the nature and role of future of cadastres. Finally, the potential responses were organized into a discrete number of future cadastral trends. Further validation of these predicted trends are required. Consequently, the link between stage 1 and 4 is left incomplete. Prior to modern information systems, cadastres primarily served fiscal or juridical functions (Williamson et al, 2009). Fiscal cadastres focused on taxation of land, while juridical cadastres focused on protecting land rights and developing land markets. European cadastres from the 16th and 17th century provide examples of the former. Australian cadastres of the 19th century provide examples of the later. Post 1970, rapid developments in information technologies and the push for environmental, social and economic sustainability led to new developments and applications for the cadastre. These are now discussed. Literature on multipurpose cadastres emerged in the 1970s and 1980s. Authors such as McLaughlin (1975) and Williamson (1985) modernized, developed and promoted the multiple uses of the cadastre. These works prompted substantial publications from the National Research Council in the USA (NRC, 1980; NRC, 1982; NRC, 1983). Multipurpose cadastres have more utility than juridical and fiscal cadastres. While they contribute to the management of land tenure and land taxation, they also underpin the important activities of land use planning, land development, environmental management and wider social organization. Countries such as Germany, Austria, much of Eastern and Central Europe and parts of Scandinavia provided robust models of what the multipurpose cadastre would look like: they exhibited multipurpose characteristics prior to the modern literature. By the late twentieth century the use of multipurpose cadastres, based on these European experiences, was considered ‘best practice’ and underpinned many other theoretical developments in cadastral science (FIG, 1995; Dale and McLaughlin 1999; Kaufmann and Steudler, 1998). This overarching concept still underpins cadastral and SDI developments in most developed countries. Moreover, developing countries implementing cadastres are well placed to take advantage of the multipurpose concept. During the 1990s the potential of the cadastre to support sustainable development was articulated in The Bogor Declaration (FIG, 1996) and The Bathurst Declaration (UN-FIG, 1999). The Bogor Declaration responded to Agenda 21 (UN, 1992) and revealed the cadastre’s role in combating poverty and environmental decline. The Bathurst Declaration helped promote the multi-disciplinary term ‘Land Administration’ and articulated the link between good land management and the cadastre: the cadastre enabled good land management by providing reliable and usable land information. These documents continue to underpin developments in the Land Administration domain, particularly in developing countries. Enemark et al (2005) built upon the framework with the Land Management Paradigm. The paradigm revealed the link between a country’s land policies, land administration functions, information infrastructures and the achievement of sustainable development. More recently, the cadastre’s role in climate change responses has received attention. Bennett (2007) outlined the potential of cadastral systems to organize new property interests including carbon credits and unbundled water rights. Van der Molen (2009) also articulated the important role the cadastre can play in organizing responses to climate change. The cadastre is now inextricably linked with the world’s most pressing concerns: sustainability and climate-change. In the 1990s the technical future of the cadastre was also explored. Cadastre 2014 provided a blueprint for the next two decades of technical advancements (Kaufmann and Steudler, 1998). The document centred on six statements. Statement 1 dealt with emerging property rights, restrictions and responsibilities and the need to manage them within the cadastral framework. Much theoretical work was undertaken in this realm with the development of the Property Object Model and the RRR Toolbox (Ting, 2002; Bennett et al, 2007; Bennett et al 2008). Statement 3 closely related to Statement 1. It deals with the evolution from Cadastral Mapping to Cadastral Modelling. The modelling process enables Statement 1 to be realized. Technical designs including the Core Cadastral Domain Model (c.f. Social Tenure Domain Model, Land Administration Domain Model) are also emerging in relation to Statement 3 (Oosterom, van, et al, 2006; Kalantari et al, 2008). These are object-oriented models for organizing property interests within a cadastral system. The models are inherently flexible. Adaptability is highlighted by developments in modelling social tenures through the work of the Global Land Tools Network (GLTN). Whilst some implementations are now evident in Western Australia and The Netherlands, all countries are still dealing with the legal complexities relating to integrated management of property interests. Other Cadastre 2014 statements included: the abolition of the separation between maps and registers (Statement 2); the abolition of pencil and paper cadastres (Statement 4); a move towards privatising elements of the cadastre (Statement 5); and the requirement for the cadastre to be cost recovering (Statement 6). Pencil and paper cadastres are now extinct in all developed economies; however, the other statements are more contentious. Many jurisdictions moved to remove institutional barriers between maps and registers; however, political inertia and embedded government silos meant this separation often continues. Moreover, a country’s context determines how privatised the cadastre becomes: many countries continue to run highly public cadastres. Cadastre 2014 has been an extremely useful document for generalizing technical developments for the cadastre in the contemporary context. However, as 2014 approaches, cadastral manages need to plan for new developments. The 1990s and 2000s saw an explosion in SDI theory and implementation. The nature, implementation and evaluation of SDIs were thoroughly researched. The ‘Spatially Enabled Society’ concept emerged to articulate how spatial technologies would drive the organization of societies and their information. SDI science impacted greatly on the cadastre. The cadastre underpinned SDI and spatially enabled societies. Land parcels are the fundamental spatial unit upon which people and governments organize their activities and how a country’s land is understood, whether they are based on formal legal tenures or informal social tenures. The ‘Butterfly Diagram’ exemplifies the relationship (Williamson et al, 2009). It consolidates contemporary cadastral theories emerging over the previous thirty years: Multipurpose Cadastres, The Cadastral Concept, Bathurst and Bogor Declarations, Cadastre 2014 (elements of) and The Land Management Paradigm are integrated in a single model. The butterfly diagram neatly articulates current thinking on the nature and role of the cadastre by showing how the parcel layer provides the essential connection between land administration functions, land information and the implementation of policies to deliver sustainable development. However, the diagram does not consider the cadastre’s technical makeup or future drivers. This paper now intends to consider these future drivers. Contemporary and predicted macro-environment drivers impacting on the cadastre were analysed using the PESTLE methodology (Aguilar, 1967; Turner, 2002). A number of scenarios tools were used to guide the analysis (e.g. IPCC Emissions Scenarios, UNFPA’s State of World Population 2009). It should be noted that the consequences for the cadastre of these drivers is discussed in subsequent sections. Good governance is now accepted as the fourth, and perhaps most essential, pillar in the sustainability equation. The need for good governance is best exemplified in the recent financial crisis originating in the United States: lack of regulation and organized information led to poor risk management and decision making, ultimately resulting in the collapse of the property and credit markets. The interconnectivity of world banking and financial systems extended the failures to the global context. These experiences leave a clear message: a well-organized layer of parcel information in a national SDI is needed to provide immediate and accurate information about land based activities. The cadastre is thus an important tool in providing good governance: the parcel layer acts as conduit by delivering social, economic and environmental information to decision makers. While the underlying role of the cadastre will continue to be tenure organization and taxation, there will be more demand for the delivery of information for decision-making, particularly in relation to sustainable development, climate change and emergency management (UN-FIG, 1999; Williamson et al, 2009). There will be pressure to improve the spatial accuracy of DCDBs and the speed at which they are updated. Climate change scientists predict more severe and more frequent extreme weather events in the coming decades. Australia’s severe bushfire events in February 2009 provide a pertinent example: 173 lives were lost, more than 600 people were injured, 2200 houses were destroyed and 1.1M hectares were burnt. This represents Australia’s worst natural disaster. These experiences are common in large scale disasters, whether they are earthquakes, tsunamis, flooding, hurricanes or fires. The need to prepare environments and quickly respond in severe scenarios will become an increasing focus for governments. Spatial information, particularly the cadastre, will be involved in preparation, response and recovery phases. For example, the cadastre could provide a framework for understanding and preparing for the impact of predicted sea level rises. Survey-accuracy and the inclusion of the third dimension (height) into all cadastres will be essential (Stoter et al, 2003). Moreover, the need for standards for integrating natural environment data with the cadastre will also be important. If such rises occur the cadastre will be used to organize infrastructure responses (e.g. levies) and the relocation of people. As in the previous thirty years, technological solutions will continue to offer new ways of organizing and utilizing cadastral information. Coordinates and 64bit processing will enable all DCDBs to be migrated to survey accuracy. New 3D visualization and analysis tools will continue to emerge: unlike previous examples focused on presenting static 3D models (e.g. early versions of Google Earth), the new platforms will enable real-time and predictive analysis of phenomena and events. Utility networks, people movements, traffic surges, social interactions and environmental flows will be captured, visualized and analysed by decision makers in real-time. Wirless Sensor Networks (WSNs) will potentially enable property interest information to be captured remotely in the field and fed directly into land administration systems (Bennett et al, 2009). The cadastre will continue to be an important component of these analytical systems: real-time accuracy, 3D property interests and interoperability through standardization of the cadastral domain will be essential. Human capacity to use these technologies will continue to increase: emerging generations expect high levels of interaction with technologies and the ability to contribute data. Spatial will no longer be special: it is will be ubiquitous and absolutely essential. The urbanization of the population will be the greatest socio-economic trend over the next thirty years in both developed and developing counties (UNFPA, 2009). Management of these mega-cities will present massive challenges to governments. The cadastre needs to be reorganized: a shift away from discrete land parcels to integrated networks of property objects will be necessary to handle the complexity. Globalisation will continue to be a significant economic force on most economies. Demand for better global land market information will increase. Events such as the US sub-prime mortgage collapse will spur the demand: the role of land in underpinning share markets and financial institutions was made patently clear to investors. Cadastres are the tool for delivering the required certainty, however, they have been largely passed over in the race to build new commodities out of land. Balance must be restored: the cadastre must reassume the role of securing all interests in land. This can include mortgage-backed securities and other complex commodities. Integration between cadastres and with financial and share markets appears a real possibility. Based on the macro-environment drivers discussed, potential characteristics of future cadastres are now summarized. These include survey-accuracy, object-oriented design, 3D/4D arrangements, real-time information, global linkages and organic characteristics. The characteristics are discussed in the order of their potential implementation. Whilst earlier paper-based cadastral maps exhibited survey-accuracy (sub-centimetre accuracy), many modern DCDBs do not (Figure 2): crude digitisation of paper-maps resulted in large errors in these databases during the 1980s and 1990s. Many applications of the cadastre will require survey accuracy: building management, utility administration, infrastructure organization, precision farming, some navigation applications and sea-level rise response all require such accuracy. Moreover, not only will ownership parcels need survey-accuracy, the hundreds of new property objects require measurement and representation (Bennett et al, 2007). Only survey-accuracy will enable the complex layering of property interests to be accurately understood. Those countries and states equipped with survey-accurate cadastres are far better placed to manage these new challenges. The concept of survey-accurate cadastres is not new: a good amount of literature already exists (c.f. Buyong et al, 1991; Elfick, 1995; Spaziani, 2002; Fradkin and Doytsher, 2002; Rowe, 2003). Currently, the majority derives from New Zealand, Malaysian, Israeli and Australian experiences: an audit of other jurisdictions appears necessary. In recent times the desire for survey-accuracy has been described informally as a pre-occupation of uncertainty-averse surveyors: fitness for purpose would be a better goal. Whilst this could be considered true, a survey-accurate cadastre will presumably fit all purposes and will therefore continue to be an ongoing aspiration, particularly as the costs and expertise required for implementation of survey-accuracy reduces. The proliferation of new property rights, restrictions and responsibilities will force a shift in focus from land parcels to property objects. Parcels will continue to be an important people-land organization tool, however, many new interests exhibit vastly different spatial footprints (Figure 3). Already, much theoretical work has been undertaken in this realm: the core cadastral domain model provides an example using the UML object-oriented language (Oosterom, van, et al, 2006; Kalantari et al, 2008). Practical implementation will require large investment and potentially dramatic re-engineering of existing cadastral systems and processes. Incorporating height and time into cadastral frameworks will be essential: management of vertical villages, proliferation of property interests and sustainability analysis require modelling and visualisation of the third and fourth dimensions (Figure 4). Technological advancements will enable traditional 2D cadastres to be extended to the new dimensions. Administrative friction caused by misinformation and poor understandings of property interests will be dramatically reduced. Consequently, planning and development times will be greatly reduced. Already, preliminary work has been undertaken to understanding the legal, policy and technical barriers to implementing 3D/4D cadastres (Stoter et al, 2003; Coors, 2002; Billen et al, 2003; Lemmen et al, 2003; van der Molen, 2003; Oosterom et al, 2006; Oosterom et al, 2006a). This important preliminary work will result in technical implementations into the future. Future cadastres will be updated and accessed in real-time. Emergency management, property market management and navigation tools require cadastral information to exhibit this quality. Currently, cadastral and owner information update processes may take weeks or months. However, soon technology will enable surveyors to measure and update the cadastre in the field in real-time. Robust checking processes will continue to ensure the integrity of the cadastre. Utility companies already achieve real-time updates across their networks: mobile computers and GPS units enable field parties to update infrastructure information in the field. To date, minimal literature on real-time cadastres exists, however, research into marine environment management systems will provide initial clues: these systems already model extremely dynamic environments (c.f. Rajabifard et al, 2005; Wallace and Williamson, 2006). Future cadastres will have the capacity to link into regional and global cadastral networks. Globalisation of economic systems and land markets (through mortgage backed certificates and other complex commodities) requires global systems of management. For example, the lack of accurate and timely information relating to the US property market ultimately lead to international investors purchasing toxic US property assets: clear information on the mortgage practices in the US was not available until it was too late. Interoperable cadastral systems appear to offer a method for integrating and better understanding the relationship between land markets (Figure 5). Like international share trading, high integrity information will be essential for organizing investments in foreign land markets. Already regional linkages between states, countries and other jurisdictions are emerging (c.f. Wallace et al, 2006). An example is ‘Cadlite,’ a cadastral product of the Public Sector Mapping Agencies (PSMA Australia). It provides an aggregated model of Australia’s state based cadastres. Moreover, technical standardization such as the core cadastral domain model (Oosterom et al, 2006) and Australia’s ePlan (Kalantari et al, 2009) will enable easier interoperability between systems into the future. Environmental management also requires integration of cadastral systems at regional and global levels: environmental problems and concerns are often spread over multiple jurisdictions. The management of the Murray-Darling Basin in Australia provides a pertinent example. Already the European Union is working on standardizing the cadastral domain to enable integration in the medium term (Martin-Vares and Salzmann, 2009). The Asia-Pacific region, through PCGIAP, has also conducted preliminary work on the concept. The Land Administration Domain Model provides a potential technical solution. Cadastres will better model the organic natural environment (Figure 6). Many new property interests are designed around natural phenomena, rather than the strict bearings and distances or Cartesian coordinates found in traditional land parcels (Bennett et al, 2007). For example, many interests in the marine environments exhibit fuzzy and changeable boundaries. Moreover, legal controls protecting flora and fauna or the land interests of indigenous communities (such as those found in developing countries) are often vague and require new tools for representation and management (Bennett et al, 2009). Ambient Spatial Intelligence achieved through the use of Wireless Sensor Networks (WSNs) will enable the continuous movement of these boundaries to be measurement and presented visually in real-time within the cadastral framework (Duckham and Bennett, 2009). Spatial information technologies and sustainability theory drove the creation of new visions, models and roles for the cadastre across the previous thirty years. They radically altered understandings of the cadastre and its potential. Many of these concepts continue to be relevant in the contemporary context, however, cadastral science must continue to look to the future: potential challenges and opportunities need identification, analysis and response. This paper aimed to begin the analysis and provide preliminary insights into the characteristics and potential role of future cadastres. New drivers impacting on the nature of role of future cadastres were discussed under the categories of political drivers, environmental drivers, technological drivers, and socio-economic. Globalisation, population urbanization, good governance, climate-change response, environmental management, 3D visualization/analysis technologies, WSNs, standardization, and interoperability were found to be critical factors driving developments in the cadastral domain. 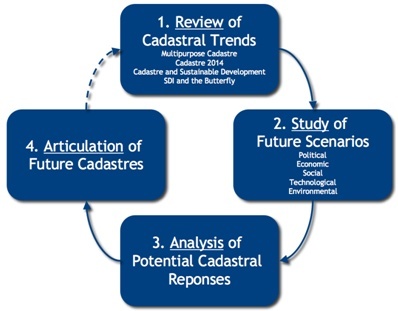 Based on these drivers, six design elements of future cadastre emerged: Survey-Accurate Cadastres, Object-Oriented Cadastres, 3D/4D Cadastres, Real-Time Cadastres, Global Cadastres, and Organic Cadastres. Together, these elements provide a potential vision for the role and nature of future cadastres. While much theoretical work has already been commenced on a number of the elements, much work is still required. Collaborative research, potentially through the FIG framework, would enable further development of the design concepts and assist in defining the nature and role of future cadastral systems. Aguilar, F.J., (1967), Scanning the business environment, Macmillan, New York, United States. Bennett, R., (2007), Property rights, restrictions and responsibilities: their nature, design and management, PhD Thesis, The University of Melbourne. Bennett, R., Wallace, J., Williamson, I.P., (2007), Organising land information for sustainable land administration, Journal of Land Use Policy, No 25 (2008), 126-138. Bennett, R., Wallace, J., Williamson, I.P., (2008), A framework for mapping and managing land interests, Survey Review, Vol 40, No 307, January. Bennett, R., Kitchingman, A., Leach, J., (2009, in press), On the nature and utility of natural boundaries for land and marine administration, Journal of Land Use Policy, doi:10.1016/j.landusepol.2009.10.008 (10 December 2009). Billen, R., and Zlatanova, S., (2003), 3D spatial relationships model: a useful concept for 3D cadastre?, Computers, Environment and Urban Systems, Volume 27, Issue 4, July 2003, Pages 411-425. Buyong, T., Kuhn, W., Frank, A.U., (1991), A Conceptual Model of Measurement Based Multi-Purpose Cadastral Systems, URISA Journal, p35-49. Coors, V., (2002), 3D- GIS in networking environments, Computers, Environment and Urban Systems, Volume 27, Issue 4, July 2003, Pages 345-357. Dale, P., and McLaughlin, J.D., (1999), Land Administration, Oxford University Press, New York, United States. Duckham, M. and Bennett, R. (2009, in press), Ambient Spatial Intelligence. In Björn Gottfried (ed.) Behaviour Monitoring and Interpretation - Ambient Assisted Living. IOS Press. Accepted May 2009. Elfick, M.H., (1995), A Cadastral Geometry Management System, The Australian Surveyor, p35-40. Enemark, S., Williamson, I.P., and Wallace, J., (2005), Building modern land markets in developed economies, Journal of Spatial Sciences, Vol. 50, No. 2, 51-68. Fradkin, K., and Doytsher, Y., (2002), Establishing an urban digital cadastre: analytical reconstruction of parcel boundaries, Computers, Environment and Urban Systems, Volume 26, Issue 5, September 2002, Pages 447-463. FIG, (1995), Statement on the Cadastre, Report prepared for the International Federation of Surveyors by Commission 7 (Cadastre and Land Management), FIG Publication No. 11, 22 p, <http://www.sli.unimelb.edu.au/fig7/cadastre/statement_on_cadastre.html>, 11 July 2007. FIG, (1996), The Bogar Declaration, United National Interregional Meeting of Experts on the Cadastre, Bogor, Indonesia, March 18-22, http://www.sli.unimelb.edu.au/fig7/Bogor/BogorDeclaration.html , 06 July 2007. Kalantari, M., Rajabifard, A., Wallace, J., and Williamson, I.P., (2008), Spatially Referenced Legal Property Objects, Journal of Land Use Policy, Vol. 25, Issue 23, p173-181. Kalantari, M., Lester, C., Boyle, D., and Coupar, N., (2009), Towards e-Land Administration: electronic plans of subdivision in Victoria, SSC2009 Surveying and Spatial Sciences Institute Biennial International Conference, Adelaide, South Australia, September. Kaufmann, J. and Steudler, D., (1998), Cadastre 2014: A Vision for a Future Cadastral System, International Federation of Surveyors, Switzerland. Lemmen, C., and Oosterom, P., (2003), 3D Cadastres, Computers, Environment and Urban Systems, Volume 27, Issue 4, July 2003, Pages 337-343. McLaughlin, J.D., (1975), The Nature, Design and Development of Multi-Purpose Cadastres, PhD Thesis, University of Wisconsin-Madison, Wisconsin, United States. Martin-Vares, A.M., Salzmann, M., (2009), The Establishment of the Cadastral Parcel as a Core Element in the European SDI - Lessons Learned and View Towards Inspiring Applications, GSDI 11, Rotterdam, The Netherlands, June. Molen, van der, P., (2003), Institutional Aspects of 3D Cadastres, Computers, Environment and Urban Systems, Volume 27, Issue 4, July 2003, 383-394. Molen, van der, P., (2009), Cadastres and Climate Change, FIG Working Week in Eilat, Israel, 3-8 May. NRC (National Research Council), (1980), The need for a multipurpose cadastre, National Academy Press, Washington, D.C., United States. NRC (National Research Council), (1982), Modernization of the Public Land Survey System, National Academy Press, Washington, D.C., United States. NRC (National Research Council), (1983), Procedures and standards for a multipurpose cadastre, National Academy Press, Washington, D.C., United States. Oosterom, van, P.J.M., Lemmen, C.H.J., Ingvarsson, T., van der Molen, P., Ploeger, H., Quak, W., Stoter, J., and Zevenbergen, J., (2006), The core cadastral domain model, Computers, Environment and Urban Systems, Volume 30, 5. Oosterom, van, P.J.M., Ploeger, H., Stoter, J., Thompson, R., Lemmen, C., (2006a), Aspects of a 4D Cadastre: A first exploration, XXIII International FIG Congress, Munich, Germany, October. Rajabifard, A., Binns, A., Williamson, I., (2005), Administering the Marine Environment: The Spatial Dimension, Journal of Spatial Sciences, Volume 50, Number 2, December 2005 , pp. 69-78(10). Rowe, G., (2003), The Survey-Conversion of Project- making a survey-accurate cadastre in New Zealand a reality, Journal of New Zealand Institute of Surveyors, No 293, June. Spaziani, D., (2002), Constructing a Survey Accurate Digital Cadastre, FIG XXII International Congress, Washington, D.C. USA, April 19-26 2002. Stoter, J., and Salzmann, M., (2003), Towards a 3D cadastre: where do cadastral needs and technical possibilities meet?, Computers, Environment and Urban Systems, Volume 27, Issue 4, July 2003, Pages 395-410. Ting, L., (2002), Principles for an Integrated Land Administration System to Support Sustainable Development, PhD Thesis, Department of Geomatics, The University of Melbourne, Australia. Turner, S., (2002) Tools for success: a manager’s guide. McGraw Hill, London, United Kingdom. http://www.un.org/esa/sustdev/agenda21text.htm , 27 June 2007. UN-FIG, (1999), The Bathurst Declaration, UN-FIG International Workshop on Land Tenure and Cadastral Infrastructures in Support of Sustainable Development, Bathurst. UN-FPA, (2008), State of World Population 2009, http://www.unfpa.org/swp/ , 7 July 2009. Wallace, J., and Williamson, I.P., (2006), Registration of Marine Interests in the Asia-Pacific Region, Marine Policy, Volume 30, Issue 3, May 2006, Pages 207-219. Williamson, I.P., (1985), Cadastres and Land Information Systems in Common Law Jurisdictions, Survey Review, 28 No 217, July, 114-119. Williamson, I.P., Enemark, S., Rajabifard, A., and Wallace, J., (2009), Land Administration and Sustainable Development, ESRI, United States. Yin, R.K., (2003), Applications of Case Study Research, (2nd edition), SAGE Publications, Thousand Oaks, California, United States. Rohan Bennett currently works as a Research Fellow for the Centre for SDI and Land Administration, Department of Geomatics, The University of Melbourne. He is working an ARC project entitled ‘Building a National Land Administration Infrastructure’. The research aims to build a framework for integrating Australia’s disparate land administration systems. Rohan completed a PhD with the Department in 2007 on Property Objects. The work has been published in Survey Review and Land Use Policy. In 2008 and 2009 he assisted with the implementation of the new Melbourne Model degree structure. He has tutored and lectured in a range of subjects including: Professional and Business Studies, Land Administration, Mapping Environments, and Surveying for Engineers. Rohan has worked as a cadastral survey assistant and engineering survey assistant and is also a Young Ambassador for the FIG2010 Conference in Sydney.